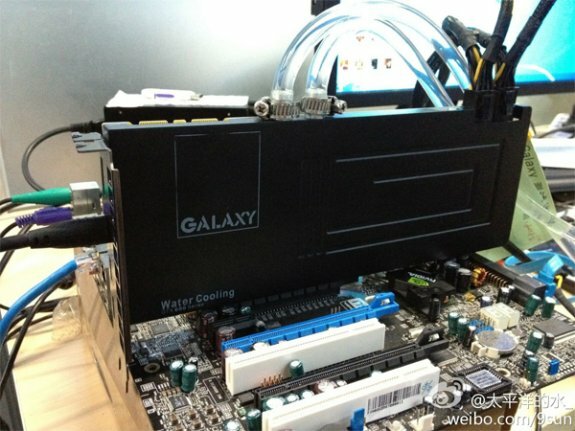 TPU discovered a picture of Galaxy's upcoming single-slot capable liquid-cooled GeForce GTX 680 graphics card. The card uses a 6-pin plus 8-pin PCIe power connector in the same plane rather than the piggy-backed connection on the reference model, and a different display output configuration. It does this by using the 6-pin and 8-pin PCIe power connectors in the same plane, instead of using an 8+6 pin piggy-backed connector that spans across two expansion slots. Also changed here is the stacked DVI connector cluster, it's replaced by two mini-DisplayPort connectors next to a full-size HDMI and a full-size DisplayPort. The card uses a full-coverage water-block, with its coolant ports protruding outwards on top, so enthusiasts will have plumb out tubing for each card in SLI setups, and can't use conventional multi-port fittings, unless of course, Galaxy has a solution for that.